New York offers attractions and visits like no other cities in the world and you may want to access to a lot of them! Then the SightSeeing PASS and the New York Pass are made for you! ├ Why should you pick an unlimited pass ? ├ Which one should you pick ? Why should you pick an unlimited pass ? It’s your second or third trip to New York: Most likely that you’ve visited the main attractions offered by an unlimited pass. They offer a greater choice out of the beaten path, less popular or unusual attractions. You’re spending one week in New York (or more) and want to see everything New York City has to offer: An unlimited pass offers so many attractions that you’ll always find something new to do. Even if you try to do 5 attractions per day, during 7 days (I don’t know if it’s possible) you won’t even do the half of what the Pass offers! You have no budget restrictions: The 7 days packages offer more flexibility to schedule your visits. If it’s something you can afford then this is a great option. It won’t be wiser to get an unlimited pass for 1 or 2 days or for a short time stay since it’s harder to make a profit: you will at least enjoy 10 visits and feel frustrated knowing that you’d only used 10% of the options offered by the pass. In fact, my personal advice is to take a 7 days package that is pricier but will allow you to do more things without feeling pressured by time. The SightSeeing PASS grants you with unlimited attractions as you wish during 1, 2, 3, 5 6, 7 or 10 days. The more attractions you visit, the more money you save! You will save up to 65% ($300) comparing to the price you'll pay separately. Having a pass allows you to skip general admission lines, you will save some valuable time! The Sightseeing PASS is valid for consecutive days and expires depending on the duration you purchased. You just have to present your mobile ticket or printed pass (QR Code) to get in! For some attractions, you will have to go to a visitor center to redeem your entry. Here you will find all the information about it. - the SightSeeing PASS is the only pass that includes the One World Observatory and the Top of the Rock, but it does not include the Empire State Building ! - the pass is activated the moment it is scanned for admission at your first attraction, bus tour or restaurant. - the pass is valid for consecutive days, depending on the duration of the pass you purchased. For example, if you begin using your 3-day pass on a Wednesday, it will be valid for Wednesday, Thursday and Friday of that week. To purchase your pass you just have to click on the button. The table shows the original rates, but in general there are discounted rates from $50 to $150 depending on the pass. - take a picture of the QR Code and use your mobile phone as your ticket. Simply present your pass at included attractions for admission! In one word, the New York Pass, grants you access at more than 80 attractions with a $300 saving on the top 10 New York attractions! The pass is valid for 1, 2, 4, 3, 5, 7 or 10 days depending on the pass. Just like the Sightseeing Pass, the New York pass only expires starting the first day of use. The New York Pass is designed as micro ship card, easy to store and use (can only be use once for each attraction). Note: kids rate applies for kids aged between 4 to 12. In addition, the New York Pass offers a number of savings or gifts in partnership with stores, restaurants, shows, entertainments and even tours that are not part of the listings. For more information on the New York Pass (locations, schedules, routes details or more), don’t hesitate to download the official guide in PDF format (229 pages, approximately 20Mo). To purchase your pass, you just have to click on the button. The table shows the original rates, but in general there's 30% off. When you purchase your pass, you receive an e-mail with a QR Code that you only have to display on your phone! You also have the option to get your pass delivered at home but it’s expensive, not a great deal if you consider the price of your pass. Expect to pay up to $25 to receive your pass by mail delivery (UPS delivery up to 3 business days). That’s extra money you can save if you simply print your voucher in exchange of your New York Pass. Once in New York, you just have to go to one of the following location to redeem your Pass. Address: 214 West 43rd Street, NY, NY 10036. Opening hours: everyday 8am to 5pm. Opening hours: 8am to 5pm. SightSeeing PASS or New York Pass? After reading the article you may don't know which pass to pick! - The SightSeeing PASS includes the entry to the One World Observatory. - The New York Pass includes the entry to the Top of the Rock. 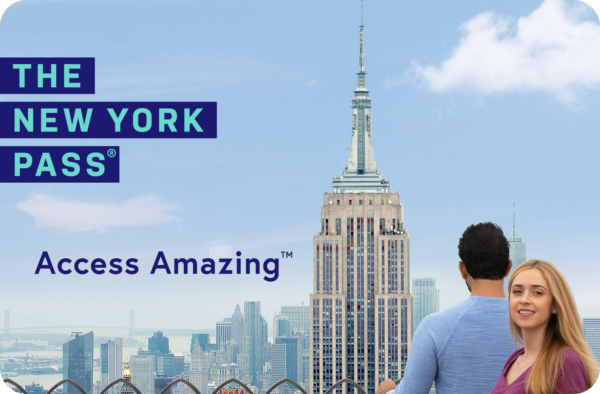 - You have to redeem your New York Pass in one of the visitor centers listed above, and you can start using your SightSeeing PASS as soon as you want! The question is not whether one pass is better than the other (both are interesting), but to find out which one is appropriate for you and your needs. If this is not your first trip and/or you are an avid visitor an unlimited Pass might be more suitable for you with guaranteed satisfaction!